The 54-year-old Scot has accepted his share of the blame for a relegation which has ended the club's 10-year stay in the Premier League having admitted just two games into the campaign that they were in trouble. However, despite the testing spells at Manchester United and Real Sociedad which preceded his arrival at Sunderland, he is confident his standing in the game remains intact ahead of an end-of-season meeting with owner Ellis Short that will determine his fate. I didn't know exactly what was going to happen behind the scenes. This is the only anomaly where it hasn't happened. "But I have got to say, it hasn't happened for quite a few managers and it has been that way for quite a while." 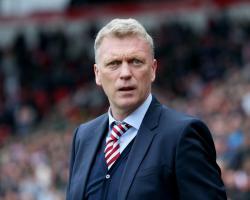 In Moyes' defence, he replaced Sam Allardyce at the Stadium of Light at a time when Short was looking to rein in spending amid mounting debts and hoping to offload a business which has become increasingly dependent upon his financial largesse. His summer rebuilding work was conducted hurriedly and increasingly desperately and with funding drying up, he found himself shopping in the bargain basement. We also would have liked to have added in January. "We knew we were experienced enough to understand what it would take to stay up and from the start, we were always playing catch-up, really. There are some bits along the journey where you would say, 'Maybe I shouldn't have done that or done this', but ultimately they're not the reasons why we are in the position we are in." Sunderland head for Arsenal on Tuesday evening and Chelsea on Sunday knowing things could get significantly worse before they get better, particularly if they play as poorly as they did in losing 2-0 at home to Swansea on Saturday. Match of the Day pundit Alan Shearer described the performance as "disgraceful" and "pathetic", and Moyes did not argue with that assessment. I was incredibly disappointed with the performance. There were some reasons for it, but I'm actually privy to the stats, I can see the physical stats and on much of that, I couldn't disagree."